Can a four-pot Mustang really be a Mustang? "Have I utterly missed the point of Mustang ownership?" 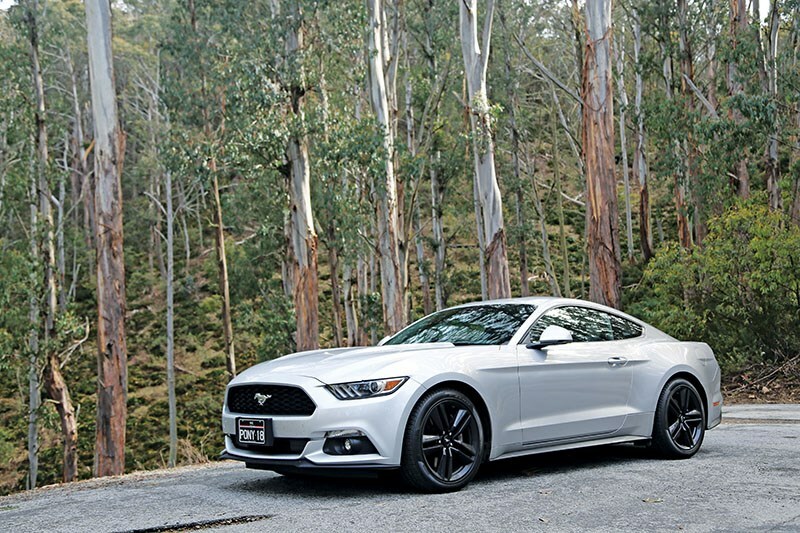 That is the one question you’ll need to resolve if you’re considering the four-cylinder 2.3-litre Mustang Ecoboost. Viewed in isolation it’s a fine car, but most think that eight is the minimum acceptable numbers of cylinders for the pony car and they’d likely feel a bit of a fraud sporting a four-pot under that vast, bulging bonnet. As long as it was able to paint a big grin on my face, I couldn’t really care less whether the Mustang has an eight, four, or six cylinders, or even one rotor up front. That simplifies this review considerably. The numbers for the Ecoboost aren’t at all bad. It makes 233kW and generates 402kW of torque, so it’s going to take something pretty senior to embarrass it in a straight line. The boys across the office at MOTOR magazine squeezed a 6.1s to 100km/h out of it, which feels about right. 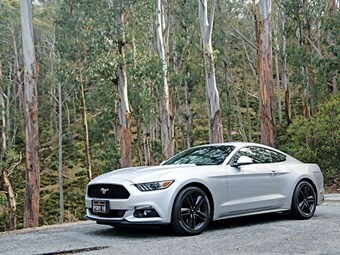 In order to really get under the skin of the entry-level Mustang, we pointed its nose at some of Victoria’s twistiest roads and set about trying to establish whether less can be more. It’s not a stellar start though. Prod the ignition button and the engine settles into a white-goods idle. 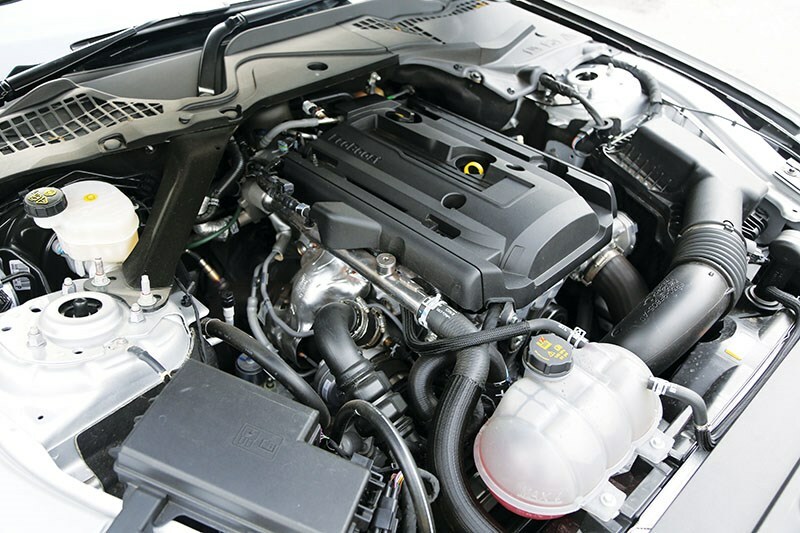 Despite piping engine sound effects through the stereo, the Ecoboost lump never really hits any high notes. Yes it sounds purposeful at times, but there’s no aural reward for revving the thing out. It’s hard to believe that, a few tuning tweaks aside, this is largely the same motor that powers the furiously splenetic Focus RS. Things get better when you throw it at some corners. With around 75kg less inertia to overcome, the front end locks onto an apex quicker and, despite slightly narrower rubber, washes into understeer later than the V8. Hats off to Ford’s chassis engineers who have calibrated the stability control settings brilliantly. Traction out of tighter corners is superb in Sport+ mode, the software smoothly delivering as many horses as the rear end can deploy. Switch all the electronics off and the Ecoboost is a bit more of a handful. Despite making less torque than the V8 almost everywhere across the range, it’s how it accrues torque that can keep you on your toes. Between 3000 and 4000rpm, the V8 adds 54Nm to its torque curve. In the Ecoboost another 244Nm is ladled on in this range, which means that yaw acceleration – how quickly the car breaks into a slide at the rear – can be very pronounced. Fortunately the steering is reasonably quick and sweetly weighted, but unless you want to star in yet another Youtube Mustang showreel, it’s best to initially practise your oversteer shenanigans somewhere with plenty of run-off and no cameras. Ride quality is a bit more fractious than it probably needs to be, the cheaper twin-tube rear dampers of the Ecoboost found a little wanting compared to the response and slickness of the V8’s monotube items. The manual gearbox likes a bit of biceps to punch it home, which is probably in keeping with the character of the car, although this engine might well be better suited to the six-speed auto ‘box with paddle shifters. Pedal positioning in the manual isn’t bad and you can heel-and-toe it down the gears acceptably smoothly but there’s little finesse in the consistency of control weights. The Ecoboost also gets smaller brakes than the V8, with four-pot calipers acting on 352mm discs instead of the six-piston Brembos and 380mm rotors of the GT. On track this may be an issue, but on the road braking performance seemed more than adequate, with a very zealous brake servo. It’s clear where Ford has cut corners in the smaller-engined car and, for the most part, the economies are well-judged but taken as a package, you get an awful lot of extra capability for an extra $10k by plumping for the V8. And therein lies the rub. It would have made a great article to have been able to forge a case for the Ecoboost as the smart money choice, but the V8 GT offers so much more capability, charisma and sheer likeability that you’d be daft not to pay the premium. Only if you’re so strapped for cash that you can just about squeak into Mustang ownership or if you like the looks of the pony car and don’t care what’s powering it can a case be made for the Ecoboost. Residual values also look a lot stronger for the V8, helping to partially offset its heftier 98-RON fuel appetite and insurance premiums. 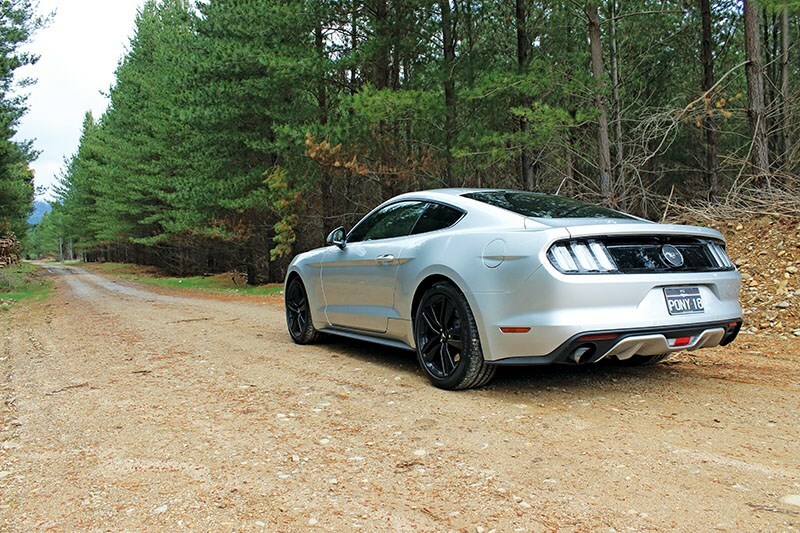 On the right road, in the right conditions, the Mustang Ecoboost is a great steer. That fun is somewhat tempered by the nagging suspicion that you’d be having a much better time with a few more cylinders up front. If the V8 never existed, I’d probably like this car a lot more. It’s one heck of an entry-level choice, but Ford’s range walk-up was designed to tempt you into the pricier car, and it’s worked on me. I’d keep on saving.